Welcome to set yourself up for success! Whether you are looking for an all-inclusive career support or just some more creativity into your job applications, you have come to the right place! Boost your career with support from an international talent acquisition expert. By using globally known, valued coaching methods you will identify your strengths and receive a personal development plan for your dream job. Take your CV and LinkedIn profile to the next level and get practice in video interviews. Demonstrate your strengths in new creative ways. With modern job application methods your talent will stand out from the crowd. Train in advance for the exact job interview you are about to have. Get customized improvement ideas and personal coaching online in English, Spanish or Finnish. Your Personal Career Trainer will help with every step! Hi there! 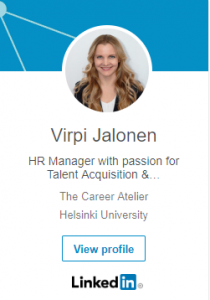 I’m Virpi Jalonen, founder of The Career Atelier and Your Personal Career Trainer. I’ll bring to you my experience from various HR roles, having specialized in recruitment and talent acquisition in international and globally known companies. I have been working in both big corporations and small startups in the fields of IT, technology and the creative gaming industry and have interviewed hundreds of people and reviewed even more CVs. Based on what I have seen, many people could bring out more their strengths, skills and creativity in their applications and could perform better in job interviews if they had the chance to practice in advance. Through The Career Atelier you can find a new direction for your career, get practical insight for improving your application and practicing for interviews. And I’m not talking about just sugar coating your old CV. I’m talking about getting to know what YOU are best at and then making sure that will be noticed also by others. Are you ready? Let’s get that dream job for you! Subscribe to my mailing list and get your free toolkit e-mailed to you! Choose the modules you need or contact for a customized offer. You will receive more information and link to reservation system after payment. 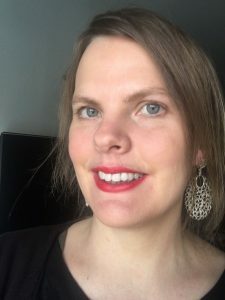 "Virpi was fantastic in helping me rethink my CV and job search strategy as I transitioned from looking for jobs in Spain to finding new work opportunities in Finland. She is full of creative ideas and solutions, and her enthusiasm and optimistic outlook are contagious! Not only did Virpi help me revamp my CV, but she also gave my morale a boost! Virpi is an outstanding professional and clearly passionate about her work. I would definitely recommend her services." By contacting I agree to the terms and conditions.